Walking with Jesus: Day 28 - Acts 9:19b-25 & Prov. 12:10-18 - Are You Prepared to Prove that Jesus is the Savior? Day 28 - Acts 9:19b-25 & Prov. 12:10-18 - Are You Prepared to Prove that Jesus is the Savior? Are You Prepared to Prove that Jesus is the Savior? Saul was not immediately put into a leadership position in the church, but he immediately went to work convincing others that the Jesus he was just recently persecuting was, in fact, the long-awaited Messiah, the hope of Israel and the Savior of the World. Saul used his training in the Scriptures to confound the Jewish opponents of Christ. He knew the Scriptures well enough to reason and make the case and prove that Jesus was the Christ. Could you do the same? If someone were to ask you to prove to them from the Bible that Jesus is the Messiah, the Son of God, the only Savior, could you? What if they did not accept the New Testament as Scripture? 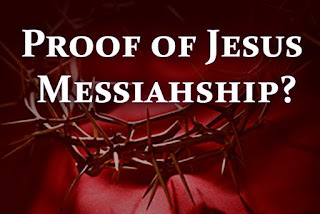 Could you prove that Jesus is the Messiah from the Torah (the Old Testament) alone? If you're not sure you could, start by studying Isaiah 53 and Psalm 22, then add in Isaiah 9:1-7 and then Micah 5:2-4. If you take time to study these four passages until you can clearly see and explain Jesus through them, you'll have all you need to engage anyone in conversation about Jesus. The great thing about these four passages is that, because they were written several hundred years before Jesus was born, they can be used even in conversations with those who don't accept the Bible as the Word of God. To get started, you can find sermons on Isaiah 52-53 here. Then, you can find a sermon on Micah 5:2-4 here. For further study, you may find this site helpful here. Every Christian has the responsibility to be able to show unbelievers from the Scripture who we believe that Jesus is the Messiah. May the Lord blessus as we study toward that end. Heavenly Father, please empower Your people with strong and clear knowledge and understanding of Your word, so we can show others that Jesus is the promised Messiah. Give us opportunities to share Jesus with others. In His name we pray, Amen. Lord, give us merciful hearts toward all of Your creation. that we may do the work You give us with all of our might. for covetousness is an attack aginst Your goodness. fruit borne from gratitude and not grumbling. and the work of a man's hand comes back to him. for only You can tame our tongues. and keep us from haughtiness and stubborn pride. for the world has always mocked Your people, and they are blind to Your wisdom. never bearing false witness, but giving clear evidence of Your goodness. for Your glory and for the good of those who hear.